FA: Greg Barnes, Jonathan duSaint, Karin Wuhrmann, Florence Scholl, October 2006. 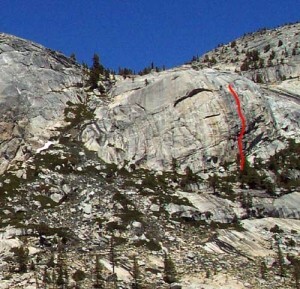 The right side of Harlequin Dome has always been the realm of intimidating roofs and 5.11 and harder climbing. The roofs are still intimidating, but now there’s a fun 5.10 route in the midst of the harder routes. Like its neighbors, Cyclone winds its way up through roofs, with one pitch only gaining 30 feet of vertical despite twice that length of climbing. The route is new and needs traffic to “buff” out the small flakes, grainy sections, and knobs – whether it proves popular or not will determine if it gets clean. The first two belays are semi-hanging and not very comfy. Rap twice with a single 60m rope, but be very careful watching rope ends (tie knots!). Which SuperTopo guidebooks include a topo for Cyclone?